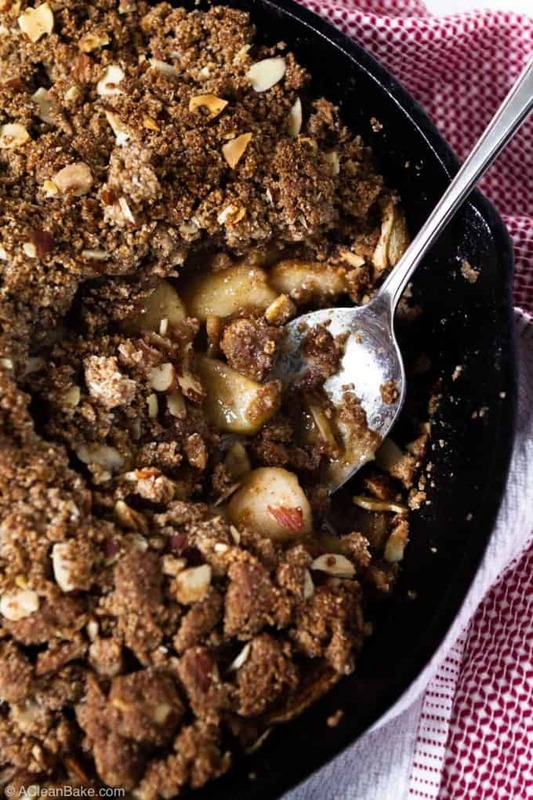 Paleo apple crisp is a mouthwatering, no-fuss dessert that will more than hold its own among all the pies on your holiday (or any other dinner party) table. 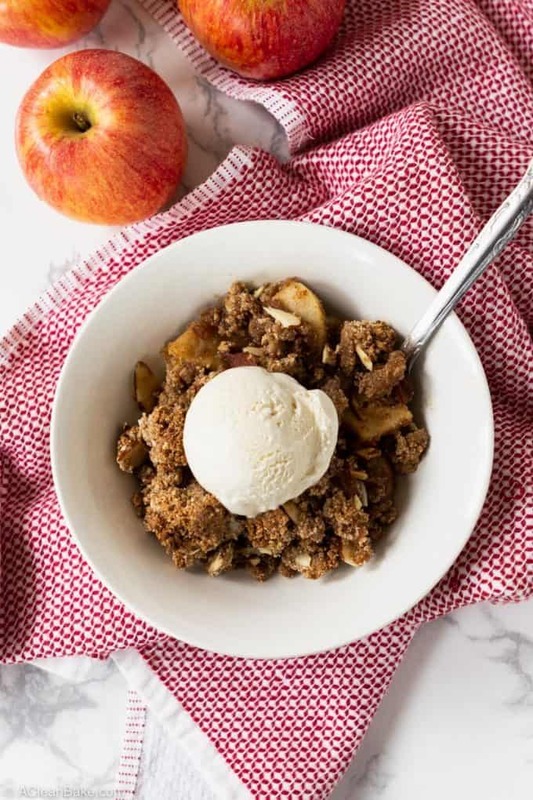 This easy apple crisp recipe is so easy, you can make it on a weeknight! Other than chocolate chip cookies, apple crisp is one of the first desserts I remember making as a kid. With an easy recipe that loosely reads: “mix this stuff together, then mix this other stuff together then dump it all in a pan”, this is actually the perfect low-effort dessert, whether you’re just learning to bake, or in a mad rush to get a huge holiday meal on the table. Or, really, anytime you have an abundance of apples and have already made applesauce. If anything, this is a very practical dessert – not to mention comfort food at its best. I made this dish for the first time on a whim; that’s how low key the ingredient list is. 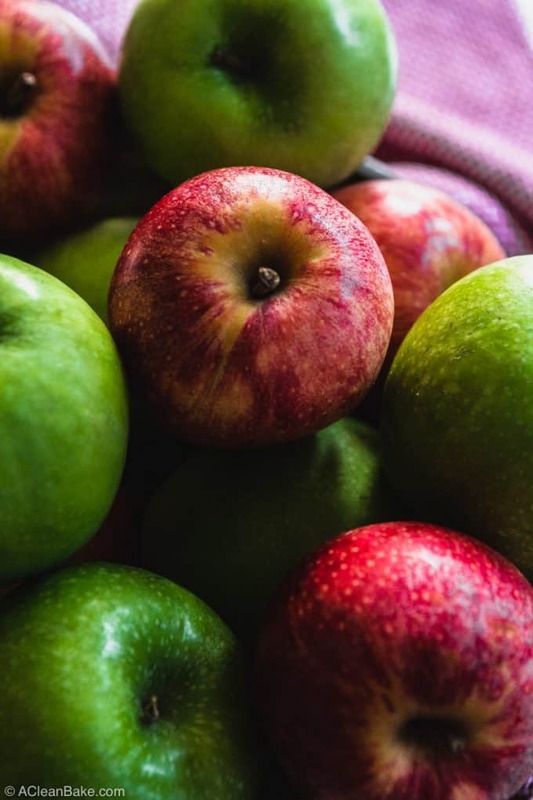 The ingredient list is long, because the ingredients are divided in two parts (the apple filling and the crisp topping), but many of the ingredients are the same in both parts. So the total number of ingredients isn’t overwhelming in the least! What’s not included in the ingredient list? Um, ice cream. 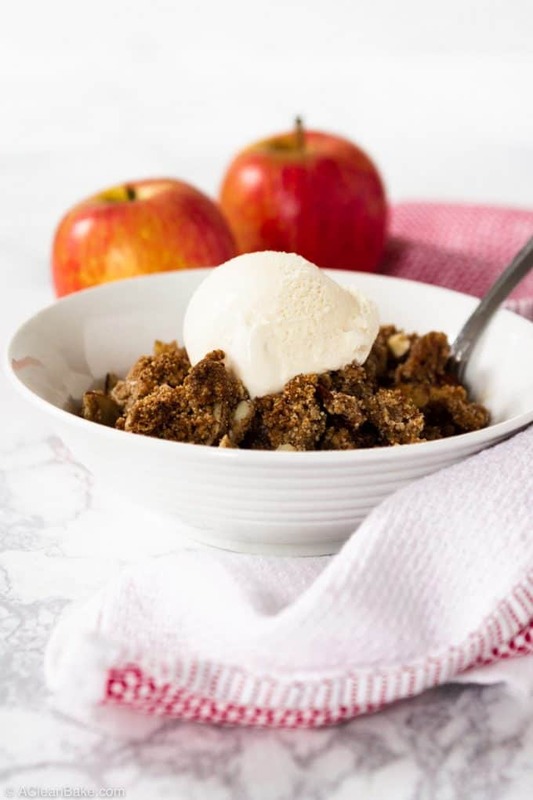 It’s not technically part of the dish, but what is apple crisp without a scoop of vanilla ice cream on top? Apple crisp and apple pie enthusiasts will tell you that there is a precise kind or combination of apples that yield the best results, and everything else will produce an inedible mess. Not true! 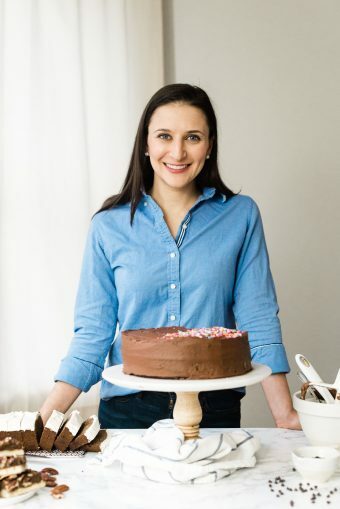 It seems like every holiday, more and more friends and family members ask me for help finding recipes that meet the increasingly-complex web of dietary restrictions that their guests bring to the table. This dessert is the perfect easy recipe for a holiday or other dinner party, because it works for nearly everyone! 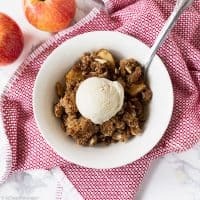 Traditional apple crisp recipes contain a few troublesome ingredients for anyone who has to follow a gluten free, vegan, paleo, or refined sugar-free diet. First, most recipes will call for all purpose flour (a form of wheat flour), both in the filling (to absorb the extra moisture that the apples release as they cook), and in the crumble topping (to act as the base and binder of those satisfyingly fat crumbles). In my version, we’ll replace the flour in the apple filling with tapioca flour, which is also known as tapioca starch. If you don’t tolerate tapioca starch, you can replace it in this recipe with arrowroot powder (aka arrowroot flour). In the crumble, we’ll use a combination of some of the standard flours you’re used to seeing in my paleo recipes: almond flour and tapioca flour). Next, conventional apple crisp recipes use butter as the fat that holds the crisp layer together. Instead, we’ll use coconut oil, which melts and moistens (to bind) similarly to butter – and has the added bonus of making the recipe dairy free and vegan, too! Conventional apple crisp recipes are often sweetened with all brown sugar or a combination of brown and white sugar. Please allow me to rant a little bit about some shameful false advertising you’ll see on many conventional baking blogs these days: lots of recipes will call, rather intentionally or just out of ignorance, distinguish between “brown sugar” and “sugar” (which refers to white sugar), and sometimes go so far as to claim a recipe contains “no white sugar”, because it is only sweetened with brown sugar. I know you are smart enough to know this already, but I’m going to say it anyway: DON’T BE FOOLED. Remember that brown sugar is made by mixing refined white sugar with a touch of molasses. So “brown sugar” is just a color and subtle flavor distinction – but it’s still just doctored white sugar. There is certainly a place for it in conventional baking since it sweetens, flavors, and melts differently than white sugar. But, if your goal is to avoid refined sweeteners, know that brown sugar is not in the same category as coconut sugar, date sugar, or even raw (cane) sugar. Ok, end rant. Anyway, all that was to say that this crisp is sweetened exclusively with less-refined coconut sugar and maple syrup. 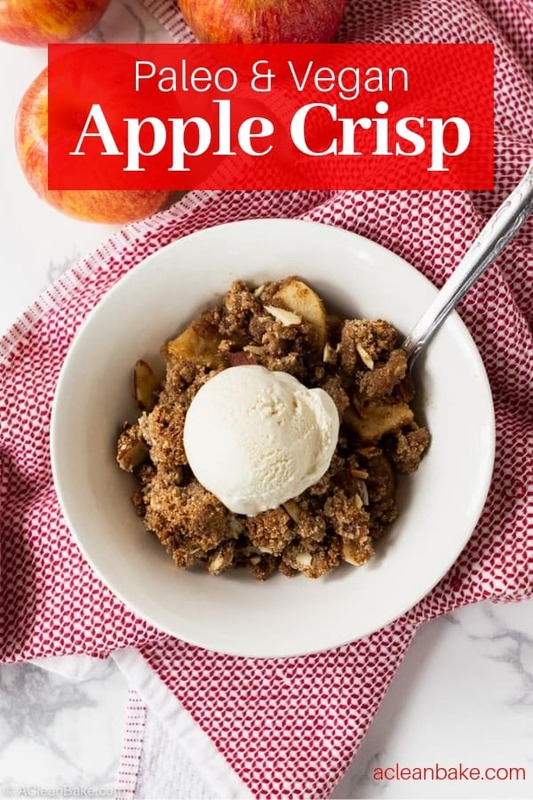 Finally, a conventional apple crisp uses rolled oats in the topping to give it a little bit of bite and, well, some crisp. So, how do you make an apple crisp with no oats? I recommend thinly sliced almonds – usually sold in grocery stores as flaked almonds – that are roughly chopped so they are the size of rolled oats. Flaked almonds offer the same pleasantly toothsome texture without any grains at all. If you can’t find flaked almonds, you can use finely chopped pecans. If you don’t want to use additional tree nuts, try using unsweetened coconut flakes instead. But, in that case, be prepared for your apple crisp to have a little more coconut flavor than you’d expect. 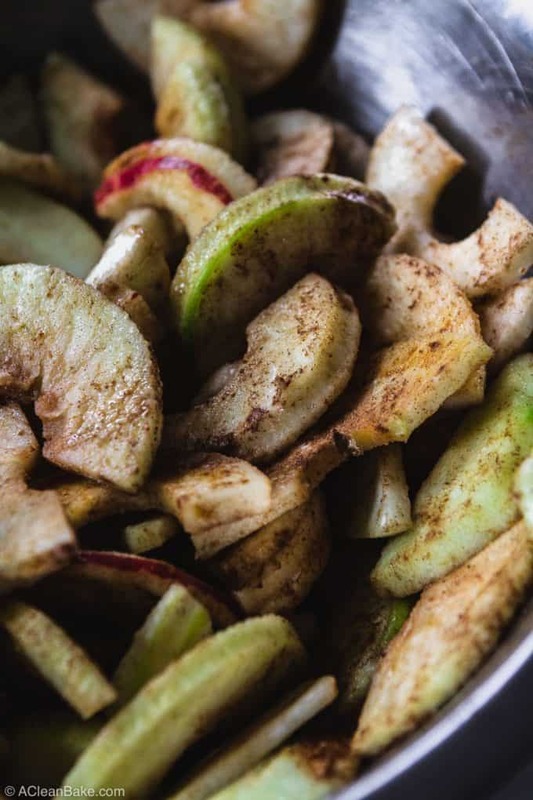 This recipe calls for a lot of apple slices, which means a bit of manual labor upfront. However, I save a ton of time and elbow grease using this simple gadget. If you have the space, it is well worth the (affordable) cost, when it comes to making apple pies, applesauce, and apple crisps less labor-intensive. If you’d like an alternative to the coconut sugar, you can swap in maple sugar or date sugar (same amount) or granulated stevia or monk fruit (to taste). Do not use a liquid sweetener like honey or maple syrup to replace the coconut sugar. If you use stevia or monk fruit, your crisp may not come out of the oven quite as golden brown as it otherwise would. If you’re not vegan, or dairy free, you can replace the coconut oil with grass-fed butter. Some people make the crumble topping in a food processor, but I don’t recommend that with this recipe. It will over-mix the crumble and turn it into more of a sandy batter. For best results, stir together all of the ingredients in a mixing bowl until just combined. Lots of large and small lumps will form, and that’s exactly what we want for optimal crumble topping texture. This dish is photographed in a cast iron pan because it’s easy and – let’s face it – also pretty that way. But if you don’t have one or don’t want to risk ruining the perfect seasoning you’ve developed, just use a lightly greased 8″x8″ baking dish. Why is the only acceptable dessert on Thanksgiving the one that requires so much making and shaping and chilling and rolling and pre-baking the crust – and once you’ve done all that, you’re only halfway finished? I made this apple crisp on my lunch break. You could prep it while the turkey is cooking and bake it while your family is eating their entrees, if you want. Bottom line: do NOT stress about dessert this year. Just make sure you have some really great vanilla ice cream in the freezer (ooh, and some [paleo & vegan] caramel sauce, too, for a caramel apple crisp variation?) for a dessert that will leave everyone satisfied. 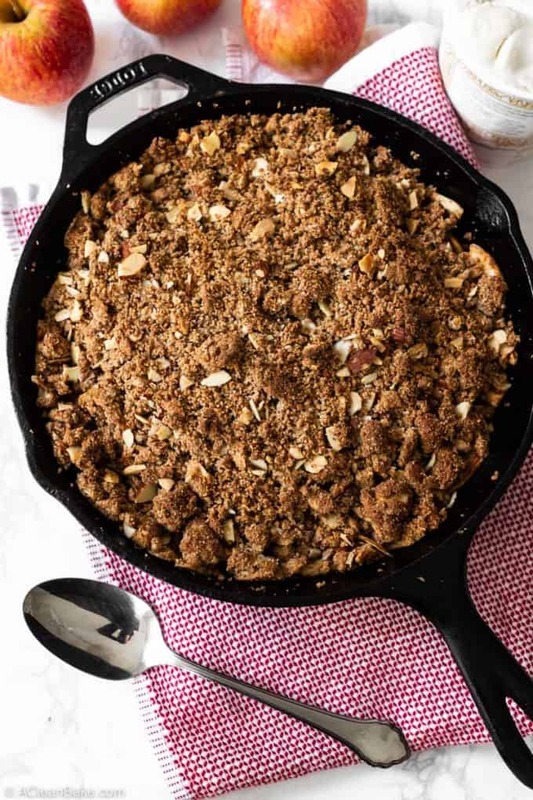 Paleo apple crisp is a mouthwatering, no-fuss dessert that will more than hold its own among all the pies on your holiday (or any other dinner party) table. But it’s so easy, you can make it on a weeknight! Use the coconut oil to lightly grease the inside of a 10" cast iron skillet or an 8'x8" square baking dish. Set aside. Peel apples, if you haven't already. Slice them and discard the cores. Place apples in a large mixing bowl. Add the lemon juice to the bowl with the apples, and toss together the apples and the lemon juice until the apples are well-coated. In a small bowl, whisk together the tapioca flour, coconut sugar, cinnamon, and salt. Add the dry mixture to the apples and toss to combine. Transfer the apple mixture to the prepared baking dish and spread in an even layer. Set aside. In a large mixing bowl, whisk together the almond flour, sliced almonds, coconut sugar, tapioca flour, cinnamon, and salt. Stir the maple/oil mixture into the dry (flours) mixture. Keep stirring, gently, until clumps begin to form and all of the dry ingredients are incorporated. Sprinkle the crisp topping evenly over the apple mixture in the pan. Bake for 30-40 minutes, until the apples are tender. Allow to cool slightly before serving, or store (uncovered) in the fridge for up to 12 hours before serving. Use a combination of sweet and tart apples, if you can. I like to use half green apples (which are very tart) and half whatever other variety I have around! Tapioca flour: I know some people don't tolerate tapioca well, so feel free to use arrowroot flour instead.